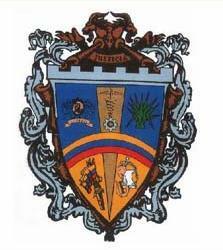 There is a flag for Municipio Iribarren's capital city, Barquisimeto, which is the forth largest city in Venezuela. Recently we were in Irribarren Municipality whose Capital, Barquisimeto, are it also of the Lara State. Taking into account which we could observe directly in some monuments of the City, we have made a sketch of Municipal Flag. In this case, we tried to represent more than to reproduce it although fitting the maximum possible to its design. You will observe a small Swiss Shield divided per fess in Argent and Azure which represent the Municipal Coat of Arms that appears on superior corner of the hoist of the Flag. In any case, it's a field divided diagonally on three stripe: superior and inferior are gray and the central one, red and yellow for represent the so called "Monumento al Sol" ("Monument to the Sun") tribute to the twilights of the region made by the famous Venezuelan Plastic Artist Carlos Cruz Diez, all superposed by a white outline which remembers the so called "Obelisco" ("The Obelisk"): a monolith erected in 1952 for commemorate the foundation of the City in 1652 and that with the time has become a Barquisimetanian icon par excellence. The flag is clear gray in a side, and dark gray in the other. the obelisk superposed to the "Monument of the Sun" has the stylization of the "logotipe" that was adopted by the Mayor Office of Iribarren, under control of the "emeverrista" [member of the government party] Henry Falcon. "Rica en alegorías, la bandera del municipio Iribarren, ondeó por primera vez el 14 de septiembre de 2001. El gris representado en esta bandera representan las aguas cenizas del Río Turbio. sobre ellos la imagen de El Obelisco, símbolo que desde hace 50 años se erige como emblema de los barquisimetanos, todos juntos evocan las más puras representaciones de la idiosincrasia barquisimetana".